For Percepta, business support is all about working closely with our Clients on the issues and opportunities that really matter to them. Our Dealer and Fleet Support solutions were born out of that core philosophy and designed specifically for our automotive Clients, offering tailored support across the lifecycle of a vehicle. 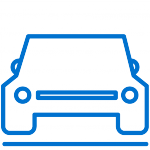 From initial purchase and throughout ownership of the car, these niche programs come in all shapes and sizes, based upon our Clients’ challenge or need. Across our Clients’ dealer network we help manage order fulfilment, work with key stakeholders and logistics partners as well as provide both online and face to face assistance through IT and field support. And for our Clients’ Fleet customers, we are on hand to manage the progress of fleet deals as well as respond to any customer enquiries or concerns. Each support program is delivered from within our Clients’ business. This partnership ensures we understand their business inside out, ensuring we continue to put their needs ahead of ours. It also gives us the desire to continuously improve our offerings and identify potential future challenges before they begin to impact on our Clients. In doing so, we can always stay one step ahead, adapting our current solutions to counteract tomorrow’s challenges. Across all of our Dealer and Fleet Support programs, our people are automotive experts and understand first-hand the important role they play in ensuring customers’ vehicles are on the road. Customer and dealer satisfaction is at the heart of everything they do. 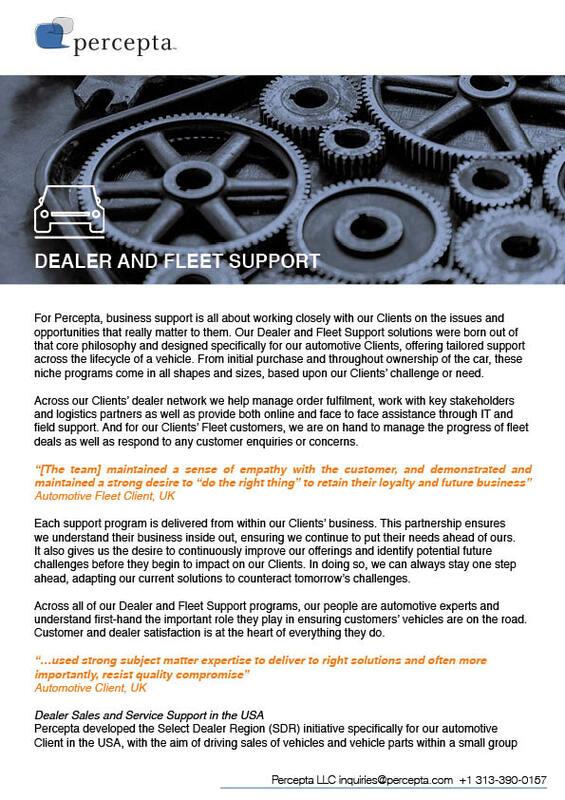 Percepta developed the Select Dealer Region (SDR) initiative specifically for our automotive Client in the USA, with the aim of driving sales of vehicles and vehicle parts within a small group of dealers. This support mechanism was designed specifically for small dealers, many of whom required assistance in meeting sales and servicing targets set by our Client. To deliver this service, we handpicked and trained a dedicated team of advocates, who by their own admission, live and breathe our Clients’ brand. They act as consultants for the dealers, offering guidance and support on enhancing sales, as well as market research to help the groups better understand the complexity of their marketplace. This niche service is seen by the Client as vital in helping the performance of their dealer network and strengthening dealer satisfaction. But there’s no room for complacency and the SDR team is always looking to the future, and how the latest technologies and sales techniques can further enhance their performance. Over the course of a year, the SDR team helped their dealer groups achieve more than 300,000 units in sales (17% of the entire dealer network in the USA), and more than $700,000 in parts sales (21% of the entire dealer network in the USA).